Northern Saw-Whet Owl - Raptor Rehabilitation of Kentucky, Inc. The Northern Saw-Whet Owl is a very small, short-bodied owl with a relatively short tail. They breed in northern coniferous and deciduous forests, using woodpecker cavities for nest sites. They do migrate to Kentucky during the winter, however, especially the juvenile birds. These owls hunt mainly at dusk and dawn, using the "sit and wait" tactic to drop down onto prey on the ground from low hunting perches. When prey is plentiful, a Saw-Whet Owl will kill as many as 6 mice in rapid succession, without eating any of them. The excess food is cached or stored in safe places and, in winter, is thawed out later by "brooding" the frozen carcass. When food is plentiful, they commonly eat only the head of the mouse. Adult mice are usually eaten in pieces in two different meals. One owl was found dead after trying to swallow a large mouse whole. They are called Saw-Whet because their call is said to sound like a saw filing on wood. Since few people now are familiar with that sound, we now say the monotonous "whoop" sounds more like the beeping of a garbage truck in reverse. 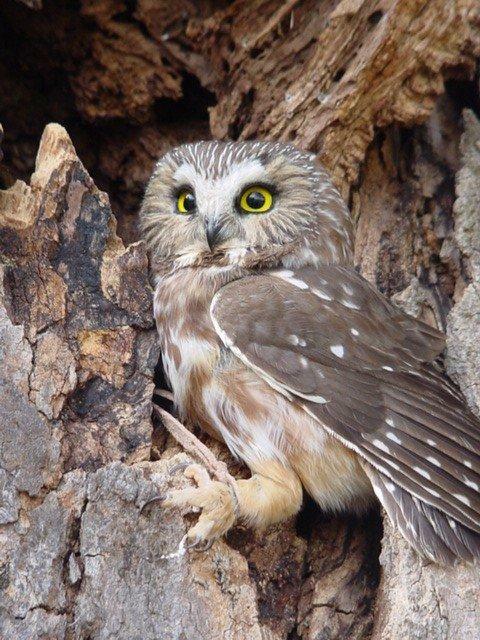 Northern Saw-Whet Owls nest in old woodpecker cavities, in relatively short trees, between March and July. The female does all the incubation, while the brings food to her and defends the nesting area. Incubation lasts for 21 - 28 days, and the young fledge in 4 to 5 weeks. The young are card for by the parents for a few weeks after they leave the nest. While she incubates, the female keeps the nest very clean. When the young are about 18 days old, she starts spending the night in another hole, and then the dirt starts to accumulate. By the time the young leave the nest, the nest cavity has a thick layer of feces, pellets, and rotting prey parts. Ruby, our education Saw-Whet Owl, came from Michigan where she was hit by a car. She has a detached retina in her left eye. She was quite old for a Saw-Whet, and died shortly after the 2016 Kentucky State Fair. We all miss her.